Several amazing wedding/event sites, the most beautiful gardens in Sayulita, 75 yards from the sand! Locally acclaimed chef at ridiculously cheap prices for the tastiest food ever! Villas Rana Verde Weddings, Retreats, Events in Sayulita is a Northside estate perfect for the most special of occasions. With panoramic ocean views and multiple areas for ceremonies, parties, and events for up to 100 guests, the estate is perfect for a Sayulita destination wedding, a yoga orbusiness retreat, family reunion, anniversary, or milestone birthday. With three rental villas on the estate, you can accommodate 20 guests onsite. On the exclusive north side only 75 yards from the ocean. Villas Rana Verde is gated and has onsite parking. A spacious 60 ft diameter, panoramic ocean view terrace with palapa for shade, comfortable seating options for dinner groups, and plenty of room to enjoy your guests. Grassy lawn overlooking the ocean and pool, surrounded by palm trees and lush, tropical foliage. A tropical garden oasis offers a choice for those who prefer not to be on the sand. Multiple panoramic ocean view sites for your ceremony and celebration! Private, gated and secure 1.5 acre estate with panoramic ocean views from everywhere only 75 yards from the sandy, private beach. Huge 60 foot across panoramic ocean view patio perfect for ceremonies, yoga sessions, amazing ocean view sunets, meals for up to 110 people, meeting, greeting and just plain relaxing. Beautiful matching flatware and matching Fiesta ware, Mexican hand loomed cotton napkins for up to 100 guests included at no charge for all event meals. Tables with chairs for 25 people. Additional seating for 20. Optional access to in house wedding planner at greatly reduced prices. Exclusive, private, acclaimed chef available for any or all your wedding/event/birthday meals (breakfast, brunch, lunch, dinner) at HUGE discount prices compared to private caterers! Special dietary meals by request. In house pastry chef specializing in wedding cakes. 3 private villas each with its own ocean view pool, kitchen, gardens, etc. Central air conditioned bedrooms! Cobblestone onsite parking for 5 vehicles and up to 8 golf carts with plugs for all behind private gates in a walled compound. 3 ocean view pools, CRV pool also has attached wading/kiddie pool with cascading wterfall. Hands down the most beautiful, matute, diverse, fun to explore (on our cobblestone paths) gardens in Sayulita! The best mattresses, pillows, 100% cotton linens, 400+ thread count sheets, incredible folk art, full kitchens, free laundry and free US/Canada/Mexico calls. Quality everything! 3 villas accommodate 17 Guests in built in beds, additional 4 movable beds, and 2 cribs. Beach access via a two minute walk from front gate on a cobblestone path to the sand! Beach chairs and towels, umbrellas, boogie boards, beach toys, pool toys and floats in a kid safe enviornment. Hotel style beach and lounge chairs. We can recommend great Wedding Coordinators that have worked successfully with Villas Rana Verde, please see the Menus & More tab above. Please contact us via the form, by email or telephone and we look forward to assisting you with your special event plans. Please see our rental page for the entire estate: Villas Rana Verde Estate or view the individual villas onsite, Casa Rana Verde, Casa Mikayla, and Casa Pajaro. Perfect property for a wedding in Sayulita! We got married in Sayulita and hosted our welcome party at Casa Rana Verde. It was perfect. We also rented out the full property for the week for our family members. It is such a unique property with a stunning view of the ocean and within walking distance/golf cart ride to the town center. The chef onsite provide an incredible meal for our welcome party that showcased an authentic tasty Mexican cuisine. Highly recommend booking this property. Amazing. More than we had even hoped for! We had our wedding at Villas Rana Verde and rented out the entire property for a week vacation. We were able to hold the rehearsal dinner, wedding ceremony, reception and the bridal brunch on the property. There were 21 people staying there and we had 50 guests at the wedding and still had SO much room. Each casita has their own private area that it was easy to have individual privacy and shared fun on the property at any time. We stayed up late for the wedding and played music and laughed all night and were able to not disturb any of our members that wanted to go to sleep earlier in the evening. The groundskeeper was awesome, he was always available to help whenever we needed it. The staff was wonderful and Barry and Connie were warm and wonderful and super attentive. The walk to the beach was short and BEAUTIFUL down a beautifully paved path and the trip into town was so easy and fun with our golf carts. I picked this place randomly, having no experience with the property, and was able to hold a wedding and a group vacation that people are STILL raving about. I have recommended this place to others, plan to revisit in the future and stand by it 100 percent. Stay here. You won't regret it! Perfect place and amazing host! Absolutely amazing place to stay and perfect for large groups! We got married on the beach and had the reception at the house and it was a picture perfect wedding. Barry was the most helpful and gracious host he always told us his only focus was our wedding and to make sure we were having the best time and he truly meant it. The house is located an ideal distance from town it’s a short golf cart ride away or a 10 min walk to the heart of Sayulita. So weather your into the nightlife or like it quite and relaxing it works for both! The views from the giant cabana and bedrooms are amazing and the sound of the waves will put you right to sleep at night. The staff were always friendly and kept the place very clean. Would definitely recommend to anyone looking to have a great time in a beautiful part of Mexico. This place is a real life paradise! My husband and I are beyond happy that we chose Villas Rana Verde to celebrate our small wedding for 60 in Sayulita, Mexico. We rented the entire estate and had our family and close friends stay for the whole week. It was an absolute dream! There was so much to explore. Every day we enjoyed the beautiful grounds and clean air-conditioned casas, 3 pools, breathtaking views of the ocean, amazing sunsets, and gorgeous landscape that was second to none. We felt close to nature, waking up and going to sleep with the sound of the waves, birds, and the surrounding jungle. It’s true as everyone says, with all the villas you feel great to be together, but you also feel a sense of privacy within your villa, especially with your own pool and kitchen. We loved this. The beds were extremely comfortable and the bathrooms were so fun to get ready and even shower in with the colorful tiles, hot water, and strong water pressure. There were always fresh, clean towels and beach towels available. The decor of the villas and kitchens was a reminder of where we were–a festive town filled with color, warmth, heart, and soul. There was so much attention to detail put in every single room, it was fun to visit everyone and see what art and colors they had in their unique spaces. Barry the owner lives next door and is very down to earth and easy to talk to. He was very quick to respond to emails and answer all questions and requests we had regarding our stay and the wedding. He made us feel welcome and was always happy to offer tips if and when we ran into him, but he really let us do our own thing overall. It was nice to see him in town socializing with other locals. His staff includes Chuy who does daily maintenance of the landscaping (I can tell he puts a lot of love into his work! ), and the sweet Lucia, who with her family not only did housekeeping but cooked for our wedding. The food was outta control! This was the best authentic homemade Mexican cuisine I’ve had. Chile Rellenos, ceviche, empanadas, steak, shrimp, and the best tortillas, beans, rice, guacamole, and flan made from scratch! The guests were impressed by their cooking and we definitely ate the rest of the leftovers the next day. I haven’t been able to stop thinking about the food and how fresh everything was. We had our ceremony at the beach down the hill from the estate, which was perfect. We hired a shuttle for taking elders down and up the hill even though it was close, but also found many people were happy to walk it. The picturesque walkway to the beach is very lush and beautiful. My mom made it her ritual to get up every morning and walk there as it was very peaceful and private compared to the beach in the main town. The palapa area was such a crowd pleaser for our reception. Here we ate and drank as we watched the sunset and danced all night. I know we were probably loud but we never got any complaints ;) I did my research and I honestly think Villas Rana Verde is the best place on the block, even without it being right on the beach. It’s nice to be away from the riff-raff of town, but still close enough if you want it! A golf cart is key here and the estate has parking for 12 golf carts! There’s a variety of closeby restaurants just down the hill, beachfront or not. Barry is an honest, humble guy who provides work to a wonderful family. Together they all make Villas Rana Verde a dream for many. I’d like to think of this as my second home now as it has officially become our happy place with so many precious memories shared with all the special people in our life. There should be no hesitation when considering this place for your event or vacation. Many thanks to Barry, Lucia & Family, and Chuy for their warm hospitality. We’ll be back!! The cozy small-town feel in Sayulita is immediate with cobblestone streets and an array of local places that you'll dearly miss. You come here for a traditional Mexican vacation sprinkled with tons of local flavor. We stayed at this property for a week and participated in a wedding so that would allow for some margin for error, but our stay was absolutely flawless. Any mess we made was cleaned instantly the next day. The beach is so close you can hear the soothing sounds of waves crashing on the beach, which makes for a restful sleep on a king sized bed. Being able to have fully access to the facility gave the property a true feeling of a home away from home. There so many good things I have to say about this property I wish there was an option for people to call me and ask about my experience, but I will leave you with this: the property comes highly recommended. 2490 characters are probably not enough to write out in this review how grateful we are for Villas Rana Verde and the whole incredible crew! My husband and I decided to get married in Sayulita and this was the place we were lucky enough to host our families and merge them into one. Everything about this place is exactly what you wish it to be. From tiny aesthetic details that feed your Mexican craving to the amazing hands of Lucia and her crew, so much of it all in its individual parts and as a collective whole were reasons to feel grateful and overjoyed for our time spent here. We spent 6 amazing days with our closest family and friends and were lucky enough to eat Lucias' breakfasts each morning, and not only that but those amazing women prepared the whole dinner and desserts the night of our wedding... the reminiscing doesn't stop. We spent a 1/3 of the price of what the average American wedding costs, which consisted of 6 days, 5 nights, breakfast every morning, clean rooms, clean relaxing pools, ocean view, wedding, late night hanging out under the main Palapa, beautiful bird calling, iguanas, colors, beautiful smells, amazing family working with Barry and Connie, hot showers, prompt communication... I can keep going. Barry, Connie, and the rest of the amazing crew, thank you once again for everything. We are beyond blessed and grateful for our stay at Villas Rana Verde. We were part of a May 2017 wedding party that rented the entire complex and couldn't have been more pleased with the accommodations. Each family group having their own sleeping area, kitchen, and pool was perfect and yet everyone was able to gather as a large group in the central palapa. Staff was very friendly and the owners helpful. We want to go back! My husband and I got married in Sayulita in May 2017. We loved the idea of being able to rent a property that our whole immediate family could stay at. After countless hours of research, reading so many reviews and soliciting recommendations we settled on Villa Rana Verde! THIS PLACE IS AMAZING! We LOVED that each family could take over the different houses and that there was a degree of seperation and privacy yet we were all together! The main Palapa was the best gathering spot and had killer views of the bay. We have a 1 year old so when it was his bedtime, we would not worry about being to loud as we could set the monitor to keep in an eye but not worry about waking him up. Being on the Northside was perfect. The property is right across the street from the beach and a 5 minute golf cart drive from the plaza. 15 minute walk to the plaza. Everything you need for a great vacation was there- comfy beds, A/C, kitchen necessities, rafts, towells, etc. Barry was an incredible host and was so helpful with answering all my questions about Sayulita, the property, necessaties and assisted in planning our Welcome Party/Rehersal for the wedding. He was indespenisble to our incredible experience. He was easily accessilbe during our stay which was added comfort. The family that Barry employees is incredible! Lucia and her family made us 3 meals during our stay - one being all the food for the Mexican Welcome Party for 70 guests. (chips, salsa, guac, pork tomales, rice, beans, chicken quesadiallas, carne asada tostadas, shrimp ceviches, and more). Everything she made was incredible! I could eat her food every day. The family was also so on top of cleaning our houses and common areas providing an overall great experience! We also utlized them for babysitting the night of our wedding. Knowing that Barry and the family has such a great relationship made me feel that much more comfortable with allowing someone I don't know very well babysit our child and take him home from our wedding. Lastly, the Palapa for our welcome party was the perfect venue! We were able to provide a comfortable space with great views, amazing food and music for the best party! We had 70 guests for a reception style party and it was perfect! In April of 2017 my wife and I were married. We chose Sayulita, Mexico because of its fun, beauty, comfortability, and affordability amongst many other reasons. We loved that all of our guests could rent large villas where we could all gather, and Villas Rana Verde was the best for one simple reason, Barry Dumont. While many of the other properties we saw were stunning there was not one we heard of where anyone met their properties owner or manager. Many of our guests couldn't even reach theirs when they were locked out. Barry is the opposite. And his property was absolutely perfect for our wedding's rehearsal dinner. The palapa area easily hosted all 85 of our guests and could have fit 100-115 in my opinion. More could certainly spill out into the pool area below, but I think most people stayed up top for ours because of the gorgeous views. The entire party tried to clamor up to the edge when the sun was setting to catch views and pictures. It was amazing to host a party where people were ooing and ahing. I don't know what was more beautiful, the sunset or Villas Rana Verde. Every detail was perfect. It was decorated beautifully with the white papel picado, hanging iron star light fixtures, and handmade linen napkins. We had plenty of room to move tables out and dance to the reggae band we hired. Everyone just had a blast. The food was provided by one of Barry's trusted team, Lucia. She cooked her famous chicken mole that Barry had hyped up for months, and he was right, it was the best I'd ever had. Served with rice, beans, grilled vegetables, and homemade tortillas. It was a huge hit. The bar operated perfectly and the bartenders were terrific. Also Barry's people. And when our guests had had enough food, drinks, and dancing they all grabbed cars from Barry's guy, Angel, of Ola Azul, who we used all week long including to and from the airport for all of our guests. His trusted people have been working with him for over a decade. They felt like friends by the time we left. I think Lucia cried a little when we said goodbye! Barry was there for us half a year before our party when we had booked his property. He helped us plan our party from the US. He worked with our wedding planner to make sure it all went off without a hitch. He kept our costs low. He did everything you'd want. From the moment we arrived to the moment we left Barry was there for us. That was the invaluable part. His property was such a terrific place to stay, and the rehearsal dinner party we had could not have gone any better. The only problem is that it only happens once. We rented all three houses on the property in November. Our son was being married right across the street. Barry was very helpful in recommending golf carts to rent (which is a must and a blast), places to shop, and restaurants. They live next door so if there is a problem, they are right there. They have a full time gardner (Chuy) and property is beautiful. It is a tropical garden. There are pools with each house. (also plenty of floats, sand buckets and chairs for the beach) They also have a full time housekeeper that will prepare home cooked meals. We had two babies and one 3 year old, so we decided it was easier to eat at the house. The food was wonderful and all freshly made. We had guacamole, salsa,& homemade tortillas with every meal. 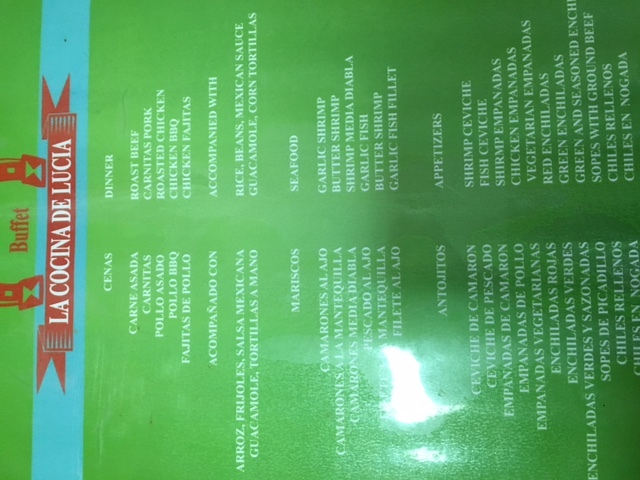 There is a menu to pick from..we loved the chili rellenos, green chicken enchiladas, and shrimp.There was always plenty left over for the next day. The homes are all decorated with fun art, colorful blankets, and local artist pieces. Very inviting for an afternoon nap! The view from the main house is spectacular. They also had two highchairs and portacribs for the babies. We had a great time!